This push-along-with-your feet-car was the object of desire of every single child at the toddler group I used to take my son to. He wanted to ride in it almost from when he could crawI, long before his legs were long enough, or coordinated enough to be able to move it himself. And I still can’t see one of these red and yellow beauties without smiling at the thought of him at 3 years old, chubby cheeked and grinning as he trundled around the yard. We never had one at home, but every time we went to a place that had one he was desperate to play in it. So for a while there a Little Tikes Cozy Coupe was his ultimate dream car. I can’t tell you how funny it is to think of him trying to get into one of these now! At fifteen he has the same wild blond hair and cheeky grin but they now top a nearly 6 foot tall body. Gorgeous – but all arms and legs and enormous feet. I’m not sure it would even be possible for him to fold his gangly frame into this little car, much less get it to move anywhere. This week I feel like God is speaking to me about hopes and dreams. When I was 20 I had dreams about what God might do with my life.. I dreamed of having a family; helping people find Jesus; healing; preaching; leading worship; of seeing revival… Some of it has happened, some hasn’t, and there’s also been load of amazing and difficult and wonderful stuff that I never expected. 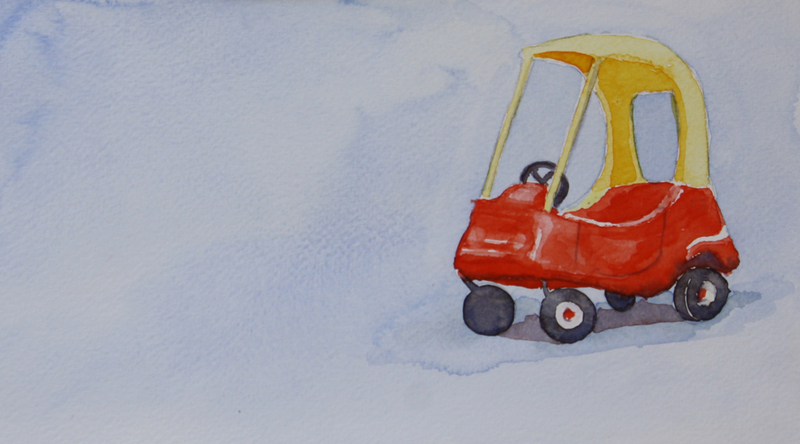 Yesterday, while I was hanging out the washing, God told me to paint a postcard of a cozy coupe. I often don’t really understand what the ‘message’ of a postcard is going to be until I’ve had a chance to pray about it, and this time it wasn’t till I sat down (in the cool of an air-conditioned coffee shop) to write that I started to hear God speak about dreaming. How does the Cozy Coupe fit into that? Well, it was Jonny’s dream. And it was a great dream for him to have when he was two, OK still when he was five, but now?… Now it is totally outgrown and limiting, utterly unsuitable. Jonny needs to get a bigger dream. Do you still have dreams about what God might do with your life? Maybe you’ve lost hold of your dreams on the roller coaster of life. Maybe you’ve forgotten what they even were. Never mind. You’ve probably outgrown them by now anyway. What good would it do you to fold yourself up into those old dreams anyway? Today is a really good day to ask God to give you a new dream, a new vision of what he wants to do with you and in you and through you. Today is the day you need to get a new dream. When you ask God about what dreams he has for your life today… write down what he says! I love your posts. Like you, I wonder if it’s too late for new dreams, but I guess not. Thanks Ellie mou. An encouraging word…….